The mise is mostly standard, but with a few surprises. For fat, this recipe starts with a mere 3 oz (85 g) of unsalted butter, far less than the Default Recipe’s 8 oz. (I was a little short and made up the difference with the slightly darker-colored salted butter seen in back — I wouldn’t normally recommend doing this but in this amount the additional salt doesn’t make much difference, and you can always reduce the salt elsewhere in the recipe.) There are three sugars here: in the mixing bowl, 2⅜ oz (60 g) of granulated sugar and 3¾ oz (105 g) of light brown sugar; in the large mise cup next to the butter, the third sugar is 2¼ oz (65 g) of a neutral-flavored honey (I think I used orange-blossom honey). The other liquid ingredients are pure vanilla extract (2 tsp), one large egg, and a tablespoon of cider vinegar. On the dry team, in addition to the 8 oz (225 g) of white whole-wheat flour (no all-purpose flour here! ), we have a half-teaspoon each of baking soda and baking powder, ¾ tsp (3 g) of salt, and — unusually — half a teaspoon of espresso powder. 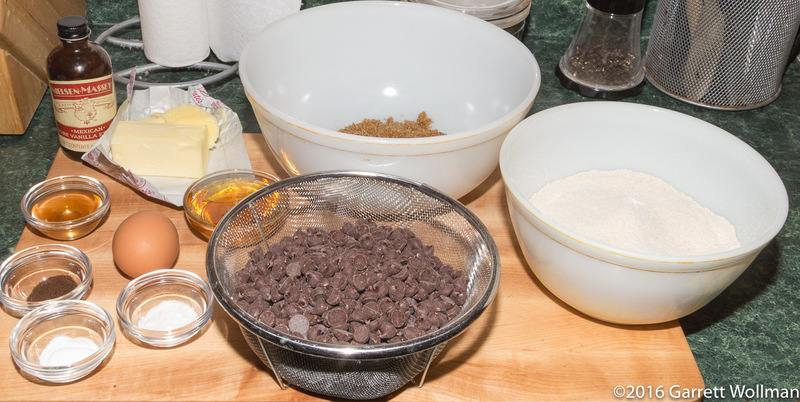 Very unusually, the recipe also calls for a full 18 oz (510 g) of chocolate chips, or about 50% more chips than normally used; I chose Guittard 46% semisweet chocolate chips for this recipe. The recipe gives an odd procedure for mixing the ingredients; I ignored that and used the standard creaming method (with a hand mixer since the butter volume is too small to cream properly in my stand mixer), switching to a large rubber spatula to fold in the chocolate chips. The recipe suggests a “tablespoon cookie scoop” (or what I would call “a number 60 disher”) to portion the dough; I used a #40 disher instead, giving 28 somewhat larger cookies. (Actually, I lie — I only got 26 cookies. But I estimate that I ate about two cookies’ worth of dough during the preparation!) These are arranged in a 3×4 array on parchment-lined cookie sheets and baked in a 350°F (175°C) oven for 10–11 minutes. Unlike traditional chocolate-chip cookies, you want to pull these out before they take color: otherwise the cookies would be dry and hard rather than soft as desired. When the cookies come out, they need to cool on a wire rack for ten minutes before moving. If you have heavy cookie sheets like I do, they’ll still be quite hot at the end of this, and the cookies will still be cooking, at least on the bottom, for most of that time, so it’s doubly important to take them out of the oven before they start to brown. After cooling on the cookie sheet for ten minutes, the cookies can be transferred to another wire rack to cool completely, which could take as long as an hour, before storing them in an airtight container. These are not quite as bad for you as the traditional recipe, which should not be too surprising considering the whole-wheat flour and substantially reduced butter and egg (given that the yield is approximately the same number of cookies) — so you can feel free to have two of these when you’re limited to just one of the traditional recipe. However, I’ve done the analysis below with a one-cookie serving size; if you use the smaller #60 disher, these numbers will be even lower. This entry was posted in Food and tagged chocolate chip cookies, cookies, honey, King Arthur Flour, recipe, whole wheat. Bookmark the permalink.